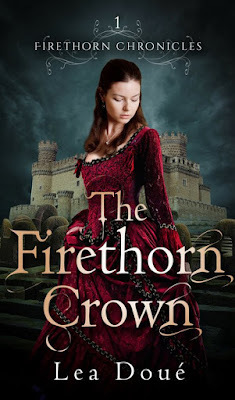 The Firethorn Crown by Lea Doué is the third adaptation of I've read of "The Twelve Dancing Princesses" with the first being Princess of the Midnight Ball by Jessica Day George and the second A Dance of Silver and Shadow by Melanie Cellier. All three books turn the mysterious underground world of glittering trees from the fairy tale into a nightmarish trap that they must find a way to escape. When I first read "The Twelve Dancing Princesses" as a little girl, I loved that the twelve sisters had a magical land they could escape to and find happiness that they didn't have in the real world. To me, that was the heart of the story, not trying to be free from a curse. That said, I didn't exactly dislike any of the adaptations I've read since it's always nice to see new takes on old stories. 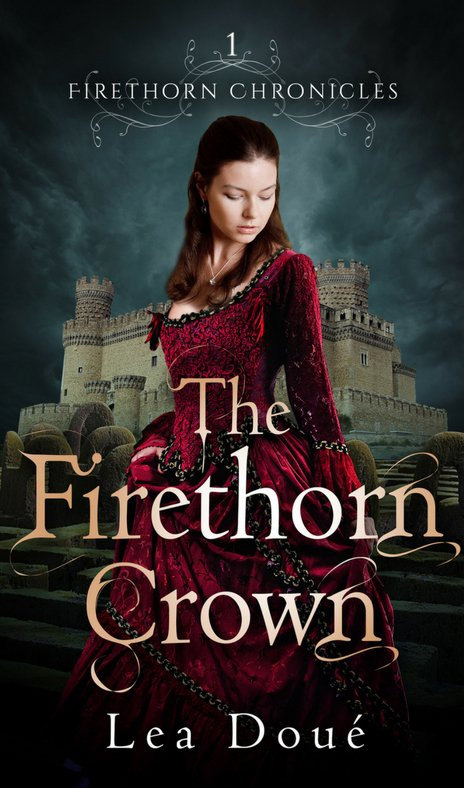 The Firethorn Crown tells the story of Princess Lily, who is aggressively pursued by unwanted suitors. As far as princess heroines go, Lily is pretty cookie cutter. She doesn't have any particular quirks outside of being the eldest and not wanting to marry someone she doesn't love. Her sisters are not particularly memorable either outside of Neylan, who always has a baby dragon attached to her. While trying to escape Lily's most aggressive suitor, the princesses find themselves getting caught in an underground world of ballgowns, shadow dancers, and a cursed prince named Tharius, who tells them they are now cursed as well. All twelve princesses must now return to the undergarden every night, and none of them can speak about it. Because she was the first to enter, Lily is not allowed to speak at all to anyone who is not already involved in the curse. What The Firethorn Crown lacks in character development, it makes up for in descriptive narrations. The undergarden exists on the other side of a hidden mirror in a garden maze outside the palace through a corridor where everyone becomes temporarily invisible before their clothes transform into ballgowns. The descriptions are beautiful and magical, just like in the fairy tale, and they make you wish that you could see it for yourself. The other thing I loved about this novel is the king. The princesses' father is absent for roughly the first three-quarters of the story. Lily's narrations make it sound as if he might not be all that agreeable of a man. When he finally shows up, he turns out to be this awesome feminist who loves his daughters with all his heart and would do anything to protect them. It was a wonderful breath of fresh air from the well-meaning yet stern kings from other fairy tales who try to force their daughters into marriage. I also found it rather interesting that the book borrowed elements from other fairy tales within the story. Tharius's curse initially sounds a lot like the curse from "Beauty and the Beast" because he needs to love someone and be loved in return in order to break it. However, curses can't force true love, so Lily refuses to trade away her heart in exchange for her and her sisters' freedom. Her inability to talk to anyone besides Tharius and her sisters is reminiscent of "The Little Mermaid." Just like the prince from that story, Lily's true love must learn to communicate with her in spite of her handicap. The Firethorn Chronicles as a series seems to be focused on more obscure stories, so Lea Doué can get away with incorporating well-known fairy tale elements into her books without coming off as redundant in future stories. The next book, The Midsummer Captives, is a retelling of Shakespeare's A Midsummer Night's Dream. At this point, I think I have to say that my favorite adaptation of "The Twelve Dancing Princesses" is still Princess of the Midnight Ball by Jessica Day George due to having more compelling characters, but The Firethorn Crown is still a good contender. The visuals in the book are lovely, and the world is very interesting. It also had what is now my favorite king from any princess story. The romance subplot was nothing I haven't seen before, but the dragons were pretty neat. If you're a fan of the original fairy tale, this book is worth checking out when you feel like a quick read.